In the sleepy hollow called Pietermaritzburg, there’s a pocket which pays close attention to events on the global stage. 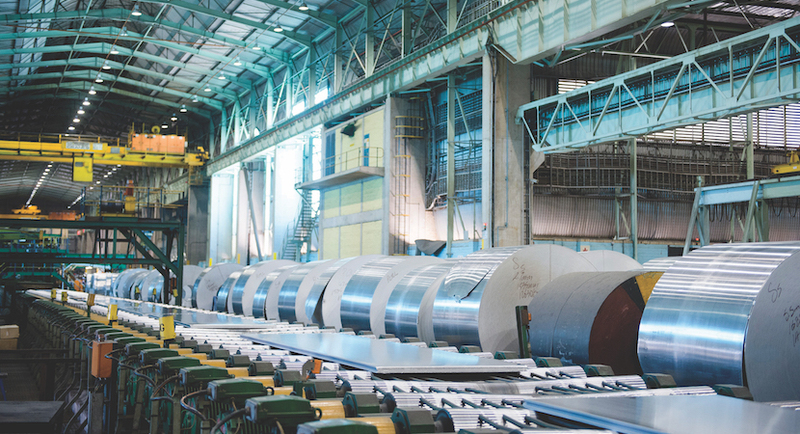 Because for aluminium fabricator Hulamin, a R1.5bn JSE-listed business headquartered in the city, its bottom line depends hugely on what happens elsewhere. That fact is illustrated in the half-year results to end June released yesterday. Operationally, Hulamin’s team continued to improve efficiencies, reduce unit costs (down 2% in real terms) and improve working capital management. But those efforts were swamped by the impact of a stronger Rand and aluminium price volatility. On the upside, for the six months Hulamin’s free cash flow was a healthy R75m compared with an outflow of R38m in the first half of 2017. This would doubtless have encouraged investors who bid the shares up 40c to 500c after results were released on the Stock Exchange News Service. This may well only be the start of a long awaited recovery. Hulamin shares, trading at five year lows, are among the most obvious beneficiaries of a potential crack in a rand that’s looking increasingly vulnerable as Ramaphoria transforms into Ramareality. There is other good news, too, like the continued retirement of debt, down by half to R297m in the past year. That reduced net gearing from an already low 15% to just 6%, and augurs well for a further reduction in the interest expense, down to R37m in the half year (2017: R39m). During the half year to end June, however, headline earnings per share collapsed by 77% to 13c a direct result of the stronger Rand and what the company calls the metal price lag (MPL). The MPL relates to the differences between the US dollar purchase price for its aluminium and that at which it is sold. A strengthening Rand hurts – and in a volatile environment, so does any unfortunate timing of metal purchases. As you should expect from a company which exports 60% of its production, the Rand’s impact on these numbers was massive. For context, Hulamin generated record profit in 2016 when one US Dollar cost R14.73. The profits were healthy if not spectacular at 2017’s average of R13.32. During the six months under review, the exchange strengthened to an average of R12.30. In constant currency terms, Hulamin tells us that underlying earnings were 23% better. But the number that matters is that 77% reverse, reflecting the fewer rands which hit the Hulamin bank account. Erratic US trade policy also played its part through triggering big swings in the aluminium price. Tightening global supply had pushed the price higher for two years. But this trend went the other way in the first four months of 2018 with aluminium hitting a low of $1,950 a ton in early April, down $300/t since January. That suddenly reversed again when the US announced it was imposing sanctions on Russian supplier Rusal. In a fortnight the aluminium price spiked $650/t before easing back $450/t to the current $2,100/t. This volatility plays havoc with companies like Hulamin who are price takers when acquiring their raw material. Commentary to Hulamin’s results informs us the “net impact of this volatility was a MPL loss of R25m”. That dropped earnings before interest and tax to R99m, a reverse of 66%. Excluding this MPL effect, the fall from 2017 would have been 41%. 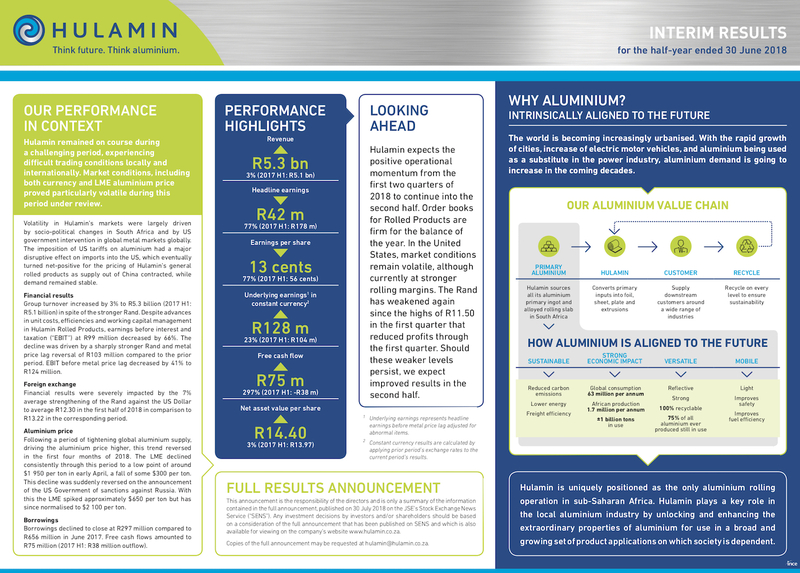 Surprisingly perhaps, US President Donald Trump’s imposition of sanctions on aluminium had a net positive impact on the company. Hulamin delivers its products to US ports of entry and “our customers are paying the newly imposed duties.” This is a relevant issue as over a fifth of the company’s sales go into the US, its largest of more than 50 export markets, and second only in size to SA. Newly-installed chairman Thabo Leeuw and long-serving CEO Richard Jacob (now into his 9th year in the hot seat) are optimistic Hulamin’s profits will improve in the second half. The “positive operational momentum” is expected to continue and order books are firm. The biggest factor, however, is the exchange rate, which has weakened significantly in recent weeks. At the current R13.20 to the US Dollar, Hulamin earns slightly over 50c a share for each six months, a significant uplift from the first half’s 13c. At that level, full year earnings of 70c a share are possible, putting the stock at seven times probable annual profits. As it also trades at a third of the book value, Hulamin shares will appeal to value investors. And especially those who believe the rand will go back into to its long term downward trend.